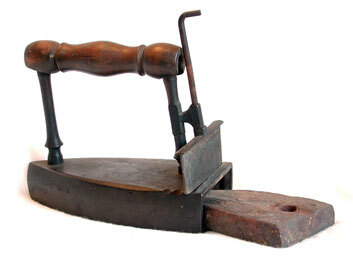 We have listed some unusual irons that may be different from what your grandmother used. Certainly Jim's grandmother never had anything this fancy. By the way, there are a lot of folks around here who don't use electricity for religious or other reasons and who still iron using items we talk about here. The image above shows an iron for the strong-armed housewife. The fancy knob on the top left was unlatched after which the iron was filled with hot coals. There were air holes for draft to encourage combustion. Air entered the combustion chamber through the crescent holes near the bottom and flowed out the scalloped openings on the lift-up lid. When the supply of hot coals burned down, they were dumped out and another shovel-full were added. Charcoal chunks would provide for longer sustained burning. 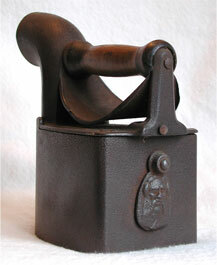 The fearsome looking iron is similar in operation to the item described at the top of this page. This modern iron had a shield below the handle to protect the users hand from the heat. Hot coals were placed in the combustion chamber through the removable lid. Draft was offered by opening the small window on the rear (with the spirit face) and the chimney is pretty obvious. 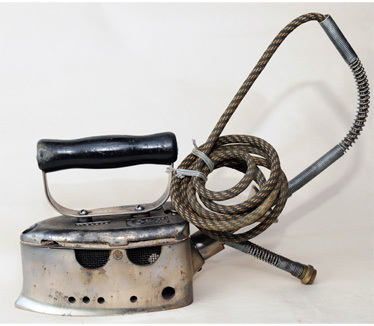 Using one of these things to iron your husband's shirts on a hot summer day with the smoke billowing around you and your hand on the warm side must have been an enjoyable experience. This iron must have been a real hit with the modern housewife. 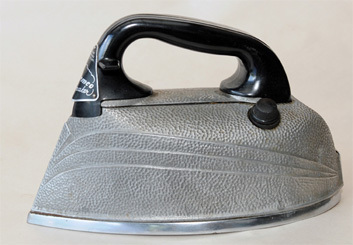 Instead of ironing while surrounded by a smoke cloud, this iron had a metal slug which was removable. Several of these heat syncs would have been provided; one would be on the stove heating up while the other was in use. The latch on the rear was elevated and the slug was removed/installed as shown. 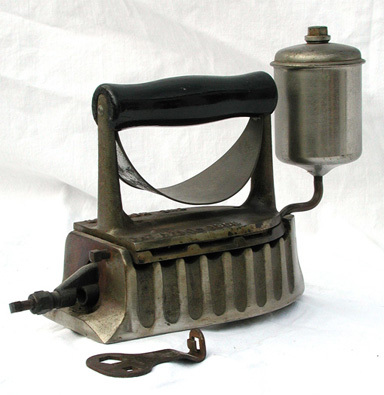 This beauty also had some distance between the handle and the iron to keep one's knuckles only slightly cooler. 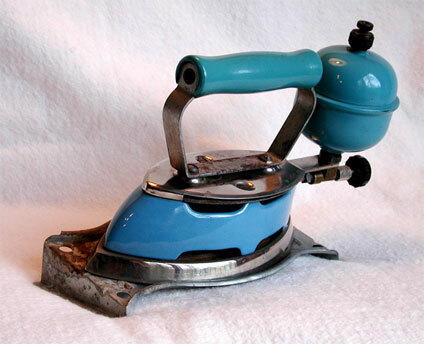 This blue iron was as handy as a microwave of its time. The small blue container on the rear is the fuel tank. 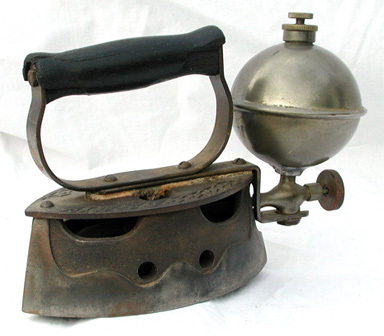 Before its inception, irons were heated on the cook stove or used charcoal and used until they became too cool to press the fabric. Ironers appreciated the on-board temperature controls these marvels offered. Before the days of air-conditioning, gas-fired irons surely kept the kitchen temperature down during the summer months as a fire would have to be maintained in the cookstove to heat the element. 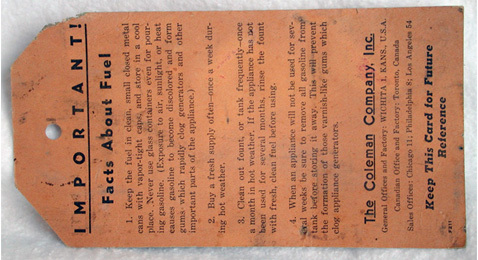 Wording on the handle indicates: The Coleman Company, Inc., Wichita, Kansas and Toronto, Canada. Patent No. 1719473. Made in United States of America. Gas irons required pressure to built up in the reservoir to begin combustion. Pressure was obtained either by an external or internal built-in pump. These pumps resembled tire pumps we all used to pump up our bicycle tires. Anyone who goes camping and uses Coleman lanterns or stoves will have undoubtedly had the pleasure of wondering just how much to pump them up. The can above is nice in that a measured amount of gas can be poured into the larger opening at the top of the can. It then can be safely poured into the iron without spilling gas on the iron. Gas on a hot iron could explode, and gas spilled on the iron could cause a fire when lighted initially. 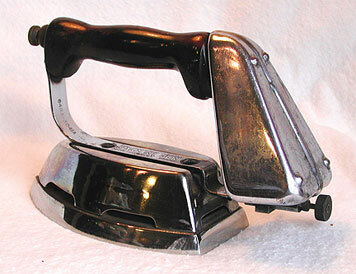 We have included a copy of a card with this iron if someone ever wants to try to use these things. The Montgomery Ward iron is Patent No. 2065492 dated Dec. 22, 1936. This iron had the benefit of having its pressure pump built-in. 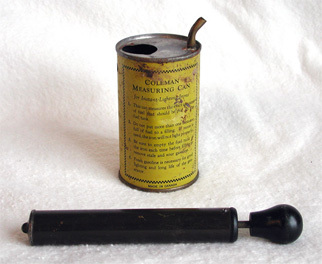 The knob on the front, which also contains the air pump, is extracted for filling the reservoir with gasoline. The pump is then reinstalled and pressure applied to commence the ignition. The leather gasket in our pump is deteriorated. 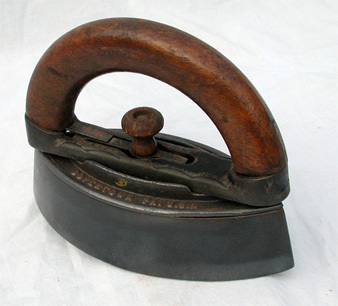 An elderly lady told us that she ironed with an iron exactly like this but always stood by the back door when using the device. She explained that her practice was to toss her iron into the back yard when it caught on fire. In her matter-of-fact tone she said it happened "many a time." Remember that before use of permanent press and other fabrics, housewives ironed their underwear, curtains, sheets and pillowcases and could spend most of the day on this chore (usually Tuesday). 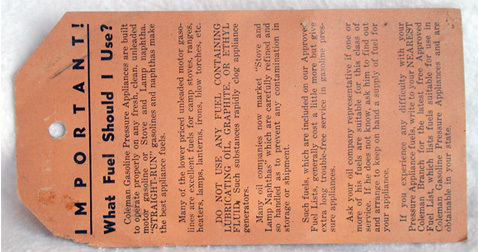 Our Monitor gas iron was patented April 14, 1903. It differs from others in our collection by having the gas tank mounted on the pointed end of the iron. While we have never ironed with one of these, it would appear that having the tank on the rear would be preferable. We are fortunate to have a key for this iron. It is made to adjust the square fittings seen on the rear of the ion. This may prevent the operator from having to twist permanently-installed hot knobs with their bare hands. A heat shield is also installed on the Monitor to keep the knuckles cooler. The cord attached to the iron above can be connected to the natural gas supply in the home for an endless supply of heat. The above iron doesn't come with a name on it so we can't provide any information on this one. We did notice the asbestos between the iron and handle which acted as an insulator. It probably reduced the amount of heat transferred from the iron to the handle. This iron was made by Colebrookdale Iron Company, Boyertown, Penn. 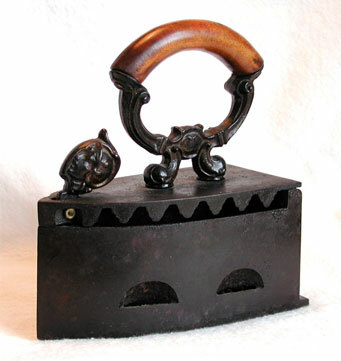 This is the kind of iron Jim's grandmother used. She placed it on her coal-fired cookstove until it reached the perfect temperature. She knew from experience exactly where to place the iron on the stove to heat it to the desired temperature. The bottom was too hot if sizzled when spat upon. Normally two irons and one handle were employed. The handle attaches and detaches from the iron by raising the wood knob. One iron was in use while the other warmed. Jim grew up in a house here in Mason County, West Virginia with no heat other than a fireplace (not unusual for older homes in the area in the early 1900s). He recalls bedtime in winter well when his widowed mother would heat her two irons up in front of that fireplace, wrap them in a page from the Charleston Gazette and slide them in his bed of a bag of straw and place one iron at his feet and the other at the feet of his little sister. Then she piled so many comforters on them that they could scarcely breathe. On Sundays in NY it is a family tradition to head out for a breakfast of potato pancakes and a walk around the huge Clarence Antique Mall and Flea Market. We took Elizabeth's mother's Buick LeSabre, because Mom knows all the back road shortcuts. 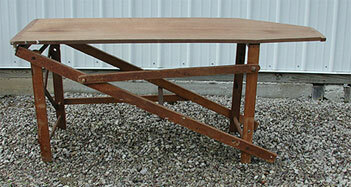 Well, Elizabeth spotted an ironing board that was made out of a single board nearly two-feet wide. Naturally she needed this specimen in her fiber arts museum. 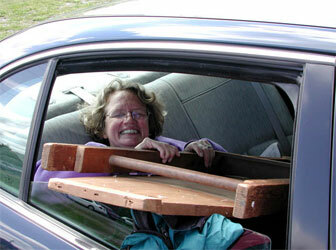 The piece would not fit into the the Buick's trunk with the two newly acquired sewing machines, so it rode home in chilly temperature with a window down as seen. From the time she saw this piece of wood, nothing could extract it from her grip which she still has in the picture above.